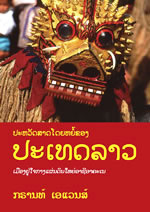 Publisher/Year: English version published by Allen & Unwin (Australia), 2003; Lao version published by Silkworm Books (Thailand), 2006. I've read a number of Grant's books. This is definitely a good all-around history primer for Laos. It really does cover quite a bit so I find it funny the author calls it “a short history”. It covers historical periods in short pieces while some parts are more lengthier than others. It does cover ancient times, royal times, government transition years, the war years and more contemporary times. 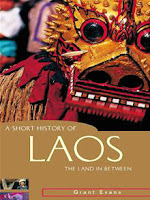 It was published as part of the Short History of Asia Series edited by Milton Osborne. If I had to describe his writing (and indeed this book) in two words, I’d say insightful and informative. I read this years ago when it was first published. I recently read it again in preparation for writing this review as I definitely had to refresh my memory. It struck me as still being very interesting even after all this time. A lot of history books remain quite useful even as time passes. Had there been a lot discrepancies or changes from now compared to when the book was written, then I could say the book is now irrelevant. But this is not the case. It’s still very relevant. There are also some random photos throughout the book as well, not many but some. They are interesting to see and are perhaps not seen much elsewhere. Further, as noted above, there’s both a Lao and an English version. Although there are plenty of Lao language history books written by Lao authors (you find random ones outside of Laos but within Laos there’s generally a decent amount of history books), it’s very rare to have a Lao language one authored by a non-Lao. I would venture to say that Grant’s Lao version of this book is probably one of the few out there. Additionally, when it comes to the portions regarding the Lao civil war, history books and historical films can take on different perspectives depending on who is creating it and which side (if applicable) that they were on. I’ve read books from the Lao point of view (both communist and non-communist) and also from the American point of view and I can say that there are at times contradictory information on both sides. But I find it nevertheless still interesting to read what each side writes about. Grant is neither Lao nor American so one would hope that his view is quite balanced – and I do believe that he is. My one criticism is that at times it seemed as though he was taking a too easy stand or approach in describing certain issues like seminar prison camps, resistance movements, how refugees are/were treated, etc. I can appreciate that the author is attempting to take a balanced view of what he believes to be truthful but at the same time not being too overly harsh. I did notice that he was bluntly honest at other times and at other times more reserved in his wording. Others might feel it was just fine and that he was simply being diplomatic. Overall this is a really good book and I’d say it’s a must have in the library collection of books on Laos. Highly recommended reading. Pick up a copy!